Thanks to the amazing Jesica, a former elementary teacher who is in charge of our children's section, we host read aloud story times at our store twice a week, and are blessed to have big crowds. Devoted families come, and also some local schoolteachers bring their preschoolers to our store for regular field trips. They troop downtown no matter what the weather. The children get some exercise, become more familiar with our community and our store, and experience the magic of story time! The children are always well behaved and enthralled with the stories and our grown up customers love to see the children being read to. I remember going to story time at the library and at school when I was a kid, and how special that time was, just being still and listening and getting completely caught up in a story. Some of the books that were read to me (like The Hero from Otherwhere, that my 5th grade teacher read to us) have stuck with me more than many others I have read. I read aloud to my own child starting from when he was two weeks old, and even now that he is 13, he still occasionally gets his dad to read to him. Even better, sometimes he now reads aloud to us. The times we share with a book are the highlight of our day, and always a good time, no matter what else happens. I know that reading aloud is also a huge part of Jesica's family life with her two boys too. So celebrating World Read Aloud Day was a natural for us at BookPeople of Moscow. We learned about it with not much time to spare before the actual day in 2013, and we quickly decided that simply having a story time all day long with guest readers from the community would be the way to go. Very low tech, and easy to flexible. We grabbed a piece of paper and started signing people up to read in 1/2 hour increments, beginning with city council people, famous local authors, the mayor, a firefighter, a teacher, the children's librarian from the public library, thespians who wanted to read portions of Hamlet… and on and on until we had a full day of reading aloud scheduled! Once the guest star readers were announced (we use press releases, posters, a sandwich board in front of the store, and Facebook to publicize our events) the schools started planning their field trips and we ended up with large groups of listeners all morning long, and smaller groups in the afternoon. The construction crews who were working on the street outside weren't even safe - we got one of them to come inside wearing his hard hat to read Goodnight Goodnight Construction Site. We had grownups reading to grownups later on the day, proving that WRAD is not just for children. This year we're planning the same kind of low tech event, and Jesica is in the process of getting the scheduled filled up with our guest readers. The thespians are planning something special too, and I can't wait to find out what they've chosen to read aloud for all of us. 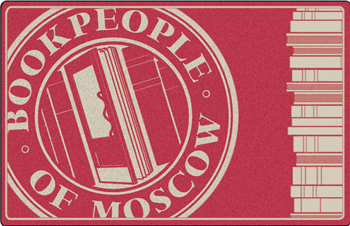 BookPeople of Moscow was founded in downtown Moscow in 1973 and has been the Palouse's favorite independent and locally-owned bookstore ever since. Connect with BookPeople on Facebook and join their joyful reading community from wherever you live!